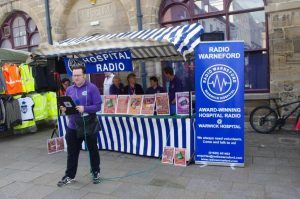 Radio Warneford is always on the lookout for enthusiastic new recruits with a few hours to spare each week to join the station in one of a number of roles. Are you a budding broadcaster, wanting to learn the skills required to put together and broadcast radio programmes for patients? 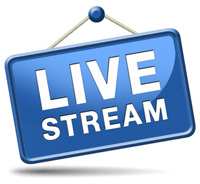 We are looking for new people to join one of our broadcasting teams. 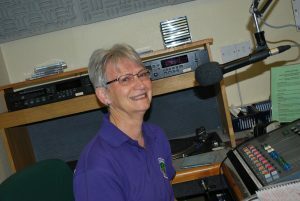 Our volunteers go out and about on the wards to meet the patients and then put together our daily Request Show and other programmes to entertain our listeners. They also take part in special broadcasts throughout the year, at Christmas and Easter for example, and they help to raise the funds needed to keep Radio Warneford on the air! Sue Dolman is on the air! 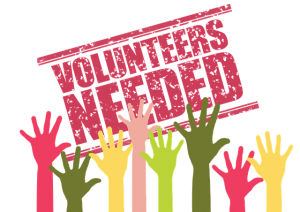 Maybe you would like to do something at Radio Warneford to help your local community but you aren’t keen to speak on air or learn the technical side of things? Then why not become a member of our daytime Ward Visiting team. Without the pressures of live broadcasting, our Ward Visitors are able to take more time to chat with patients on the wards, help them tune in to hear our programmes via NHS Wi-Fi and collect music requests for the programme later in the day. Joining our team couldn’t be easier. You don’t need any special qualifications to become a member and previous experience is not required. If you enjoy being part of a team, like meeting and chatting with new people, enjoy a range of music, have buckets of enthusiasm and a great sense of fun, then we want you as part of our station! You’ll need to be able to attend our studios at Warwick Hospital on a regular basis – the exact days and times will depend on the team that you join. We provide a complete training programme for all of our volunteers, whatever their ability or experience. Sorry, we cannot take anyone under the age of 16 but on the other hand, there is definitely no upper age limit! Cliff Proctor at the 2018 Grand Raffle Draw in the Market Place in Warwick. You can telephone us at any time to book a taster evening where you can see what goes on and meet some of our members before deciding whether you want to take it further. You can also request a membership pack by phone to be sent to you through the post or just find out more about what we do. Call us on (01926) 401402, leave your contact details on our answerphone and we will get back to you. If you have decided that you would like to join the team, please download our application form. Print it out and then once you have completed it, you just need to send it back to us at the address given on the form. Why not take up the challenge right now! Join the Radio Warneford team and make a real difference in your community.